Hey everyone, I’m Caroline from Chocolate & Carrots, a blog where I make your favorite desserts a little healthier for you, with a side of my calorie-free cutie pie, Liam! 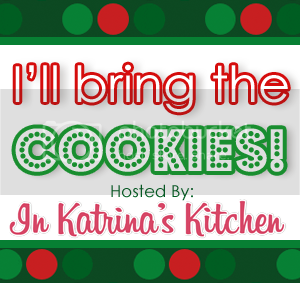 I’ve been loving all of the amazing cookies that you’ve been bringing to Katrina’s Kitchen. I’m so excited to bring a batch too! I’ve made quite a few chocolate chip cookies in my day and I officially proclaim that these are in my top 5 favorite ever. The two types of chocolate chunks scattered throughout the cookies are a perfect balance of bittersweet and silky smooth. The cookies themselves are soft and chewy…you can’t just stop at one! To top it all they are made with half of whole wheat flour! You’d never guess when you take a bite! My only regret is that I didn’t save more for myself. I sent them off to my husband’s coworkers to share the love. My thighs are thanking me, but my tastebuds want more! Good thing they are simple to whip up…I’ll just have to make some more right away! Seriously, who can say no to that ooey, gooey melted chocolate in a just-out-of-the-oven cookie. In the bowl of your stand mixer, beat the butter until creamed (about 2 minutes) with your paddle attachment. Add in the canola oil, brown sugar, and sugar. Beat until nicely incorporated (about 1 minute). Beat in the egg and vanilla until light and fluffy (about 3 minutes). Add in the flours, corn starch, baking soda, and salt. Beat until just combined. Chill the dough in the fridge for at least 1 hour. Separate the dough into balls. I did 2" (about 2-2.5 oz) balls, but I also did some with 1" (1 oz) balls. Just take your pick! Place the balls in the fridge until you're ready to bake. Place the dough balls 2" apart for the 2 oz balls or 1" for the 1 oz balls on a silpat or parchment paper covered baking sheet. With the 2" balls, I fit 5 on a baking sheet. Bake for 10-12 minutes (12 was my magic number with the 2" balls) until lightly browned around the bottom edges. Allow to cool for 5 minutes on the baking sheet before transferring to a cooling rack to cool completely. One thing is for sure…you can never go wrong by adding chunks of chocolate to anything! Double it? We are friends for life! You should really go see for yourself the deliciousness that comes from Caroline’s kitchen. You can connect with Caroline on Facebook, Twitter, Pinterest, and her blog Chocolate and Carrots. Thanks for bringing the cookies, Caroline! Ooh, that gooey melty photo is making me crave a cookie! Yum! Ahhh they're sooo gooey!! I love it! My recent post On The 12th Day of Christmas…A KitchenAid Food Processor Giveaway! Oh goodness look at all that melted chocolate!! Now that is irresistible. Ah these look delicious. I love trying new chocolate chip cookie recipes and these look amazing, love the gooey chocolate!